The Amel Zenoune-Zouani Rights and Leadership Award in 2018 was received by Honorable Angela Bradstreet during the 5th Anniversary Gala event on March 8, 2018. Hon. Angela M. Bradstreet is a judge of the San Francisco Superior Court. This year, Rights and Leadership Award was named for Amel Zenoune-Zouani, an Algerian law student who was murdered by fundamentalists in 1988 for refusing to give up her studies. 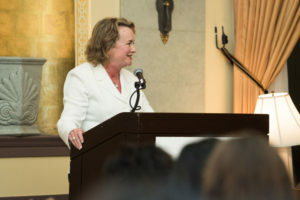 Judge Bradstreet was honored for her unwavering championship of the advancement of women in the legal profession, her effective leadership for gender equality, and her dedication to mentoring the next generation of leaders for equality and justice. A past president of Queen’s Bench, California Women Lawyers, and the Bar Association of San Francisco (BASF), she has provided passionate and innovative leadership in every role. While president of BASF, she established a “no glass ceiling” task force to foster promotion of women into management roles at law firms and legal departments. The initiative was a model policy, as she worked with other bar associations locally, nationally, and internationally to launch similar programs. Judge Bradstreet has also been a leading voice for LGBTQ equality, including spearheading a policy adopted by the San Francisco Superior Court to prohibit judges from being members of organizations that discriminate on the basis of sexual orientation, the first such policy adopted by a U.S. trial court. She was appointed to the San Francisco Superior Court in 2010.